The production and consumption of oil, gas and coal has been one of the primary drivers of global growth and development for more than a century. Unfortunately—and ironically—those same fuels are now the greatest threat to our future wellbeing and prosperity. Fossil fuels are the main source of human-made greenhouse gas emissions (GHGs) and the root cause of anthropogenic climate change. If we don’t rapidly transition off of fossil fuels, we risk catastrophic and irreversible changes to the earth’s climate. But how difficult will that transition be for Canada and the rest of the globe? It’s no secret that the world economy runs on fossil fuels, but the extent to which humankind depends on oil, gas and coal varies significantly from place to place, and so too does each country’s ability to transition to a low-carbon economy. In an attempt to capture this variation in fossil fuel dependence between countries, I have developed a measurement tool: the Fossil Fuel Dependence Index (FFDI). The FFDI scores each country from 0 to 100. It is weighted 50% toward fossil fuel consumption (the share of oil, gas and coal in the total amount of energy we consume to heat our homes, move around and maintain our standard of living) and 50% toward fossil fuel production (the share of the oil, gas and coal industries in our exports and the broader economy). At a time when some Canadian governments are pushing new fossil fuel infrastructure as an economic necessity, and despite our status as one of the world’s highest per capita emitters, the FFDI suggests Canada’s economy is already diversified enough to make deep decarbonization possible over the coming decades. Based on the FFDI, the most fossil fuel dependent countries in the world are Middle Eastern oil producers, led by Kuwait with a score of 87. These countries, including Iraq (84), Saudi Arabia (81) and Oman (81), get practically all their energy from fossil fuels, and their economies are overwhelmingly reliant on fossil fuel exports. The least fossil fuel dependent countries in the world are mostly found in Africa, led by Ethiopia with a score of 6. Many of Africa’s least developed countries, such as Rwanda (7), Burundi (9) and Uganda (9), consume little oil, gas or coal and do not have significant fossil fuel industries. Most developed countries score in the 30s and 40s, including Canada (45), but there are outliers. Despite its high standard of living, Iceland scores just 9 on the FFDI due to extensive renewable energy infrastructure. In contrast, coal-mining, coal-burning Australia scores 55. A few countries have made progress in reducing their dependence on fossil fuels. For example, Sweden (22) has reduced its FFDI score from a high of 27 in 1990. But many have gone in the opposite direction. With an FFDI score of 40, India is far more dependent on fossil fuels today than it was in 1990 when it scored just 25. Overall, the world scores a 45. The world score has stayed roughly the same since 1990, which is the earliest year for which comparable data are available. Of course, the world economy has expanded significantly in that time, so the total amount of fossil fuels we consume has skyrocketed in absolute terms. Why does the FFDI matter? A country’s individual FFDI score is arbitrary; for example, a score of 50 does not necessarily mean a country is “50% dependent” on fossil fuels. But the index does let us compare countries. It is worth noting, for example, that the Netherlands (51) scores much higher than its neighbour Denmark (36). Despite comparable geographies and levels of development, Denmark has found a way to rely less on fossil fuels as a share of its economy. Importantly, the FFDI does not correlate closely with per capita greenhouse gas emissions. Many countries that are not highly dependent on fossil fuels are nevertheless large per capita emitters, such as Uruguay (24). These countries typically do not produce fossil fuels but they still produce emissions from agriculture, transportation and other sectors. In contrast, many of the countries most reliant on fossil fuels are minor GHG emitters on a per capita basis, such as Algeria (79). These countries export most of the fossil fuels they produce, rather than consuming them domestically. So while the FFDI is not useful as a measure of a country’s current or past contribution to climate change, it is useful as a forward-looking indicator of how difficult the low-carbon transition will be for that country. For example, despite being one of the world’s highest per capita emitters, Canada (45) can still feasibly phase out oil, gas and coal in a relatively short period of time through electrification, new renewable energy capacity, and energy efficiency improvements. The Canadian economy is diversified enough and relies enough on existing renewable energy infrastructure to make deep decarbonisation both possible and productive in the coming decades. In comparison, a country like Ecuador (60), which produces a fraction of Canada’s emissions on a per capita basis, is nevertheless far more dependent on fossil fuels as a share of the economy. As a result, without outside help, Ecuador faces serious structural barriers to the low-carbon transition. Every country is implicated in climate change and the need to transition to a low-carbon global economy. That means phasing out the production and consumption of oil, gas and coal across every part of the globe. But the transition will be easier for some countries than for others. 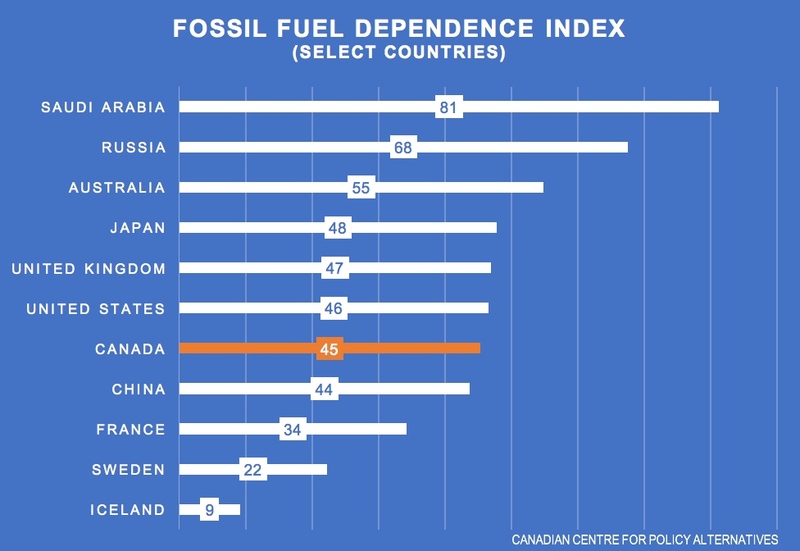 The Fossil Fuel Dependence Index highlights, on the one hand, the countries with the greatest capacity to reduce emissions with the smallest structural changes (low FFDI scores) and, on the other hand, the countries that will need to make the greatest transformations and will require the most help to do so (high FFDI scores). The FFDI is a work in progress presented here for discussion. Further work will explore some of the ideas introduced above. Your comments and feedback are welcome and appreciated. The FFDI is calculated using four data series retrieved from the World Bank’s World Development Indicators: (1) fossil fuel energy consumption (% of total); (2) renewable energy consumption (% of total final energy consumption); (3) fuel exports (% of merchandise exports); and (4) total natural resources rents (% of GDP). Comparable data are available for the years 1990 through 2014 (the current year for the FFDI scores in this post). The first two data points give a clear and corroborated picture of a country’s dependence on fossil fuel consumption. The third and fourth data points provide at best a loose approximation of an economy’s dependence on fossil fuel production, which is the most obvious weakness of the FFDI. More direct and representative indicators of fossil fuel production (e.g. share of the workforce employed in oil, gas and coal extraction and processing) are available for some but not all countries, so the present methodology permits broader but less accurate comparisons than those data would allow. PwC’s Low Carbon Economy Index takes the alternative approach. It includes more varied and comprehensive data points than the FFDI, but covers fewer countries.